Onion samosa is different from the regular Punjabi style samosa in terms of the filling as well as the texture of the outer dough layer. 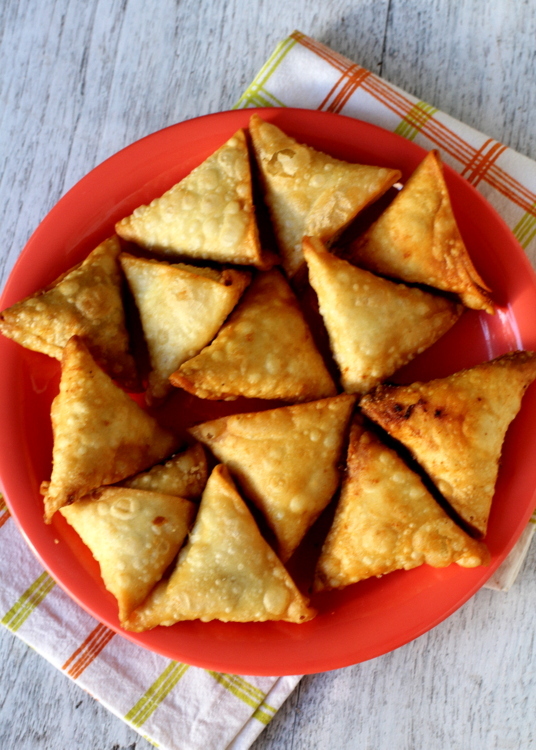 Onion samosa has a super crispy, smooth exterior with a lightly spiced onion filling. 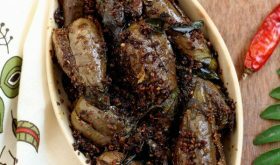 The onion filling is mixed with powdered poha aka beaten flat rice flakes which absorbs any moisture that the filling might have. The key to a crisp samosa is in the samosa pastry dough that has to be kneaded to the right consistency, rolled to the perfect thickness which is neither too thick nor too thin and the samosas have to be fried in oil that is not too hot, on a low medium flame to achieve a golden brown, crisp exterior. I must thank Mina Joshi for her tips on how to make crispy onion samosa. You will find lovely blog for a step by step tutorial on how to roll the samosa pastry and wrap the pastry sheet with the filling on her blog. Do try this onion samosa recipe and leave your feedback. In a bowl, add flour, salt and lemon juice and mix well. Add warm water, little by little, to make a smooth yet pliable dough. Cover with a damp cloth and leave aside for 20 mts. Meanwhile make the filling. Heat a cooking vessel, add oil. Once oil is hot, add sliced onions and saute on low to medium flame for 3-4 mts. Add red chili powder and mix well. Turn off flame. Add the ground beaten rice and coriander leaves and mix well. Remove to a bowl, leave aside while you preapare the samosa pastry. To prepare the samosa pastry, make lemon sized balls of the dough and leave them covered while you roll the balls into thin rotis. Make two rotis that are 3" in diameter. Smear a little oil all over one roti and place the other roti over it. 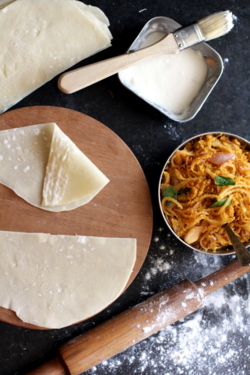 Sprinkle some flour on the work surface and roll it into a thinner and larger roti. Keep aside the prepared roti and cover with a kitchen towel till you prepare rotis in the same manner with rest of the balls. Heat a tawa or skillet on medium flame. Place a roti on the tawa and allow to cook slightly for approx 18-20 seconds on each side. Do not allow to cook completely. Remove from tawa and slowly seperate the two rotis. Prepare with rest of the rotis likewise and keep them covered with a kitchen towel. Cut each roti into two halves and keep aside. Add salt to the onion filling just before you begin to stuff the samosa pastry with the filling. Follow the above pictures on how to fold the samosa pastry sheet along with filling and seal them with the flour paste. 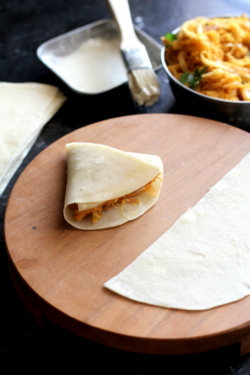 Prepare samosas with rest of the pastry sheets. Cover the prepared samosa with a kitchen towel and allow to sit for 10 to 15 mts. Heat oil for deep frying in a heavy bottomed vessel. Once the oil is medium hot, reduce flame to low-medium, add 4 to 5 samosas into the oil carefully and allow to cook on both sides till they become golden brown. Do not cook on high flame. 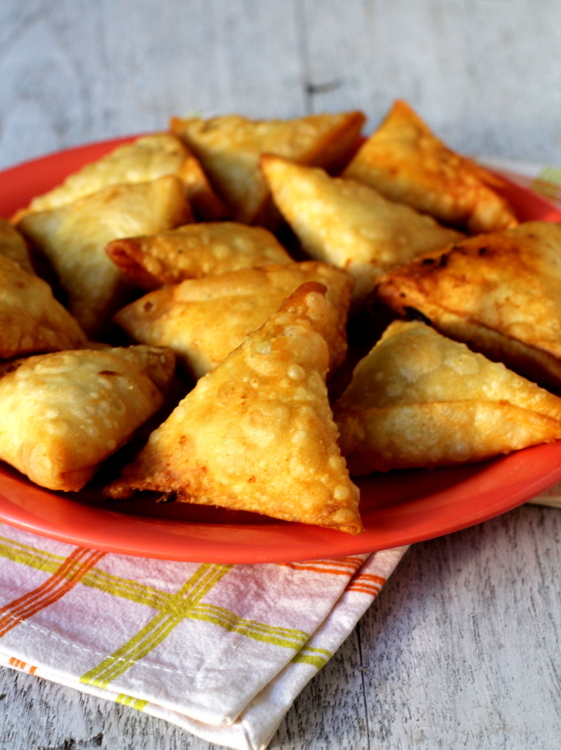 Remove the fried golden brown samosas onto an absorbant paper. You can use raw onions to make filling i.e you need not saute the sliced onions. I like to slightly saute the onions. By Sailu Published: August 23, 2013 Crispy Onion Samosa Recipe is one of India's classic evening snacks recipes. Popular as Irani samosa, it has a crisp exterior with a spiced onion stuffing. where did we use the flour paste? I didnt get that part of the recipe? Do follow Step 9 of the recipe. Can we use pstry sheet instead and bake it oven. I know taste differs but is it even worth trying? Phyllo sheets work best for this. I have tried them and they come out really crispy. Thanks for the tip. 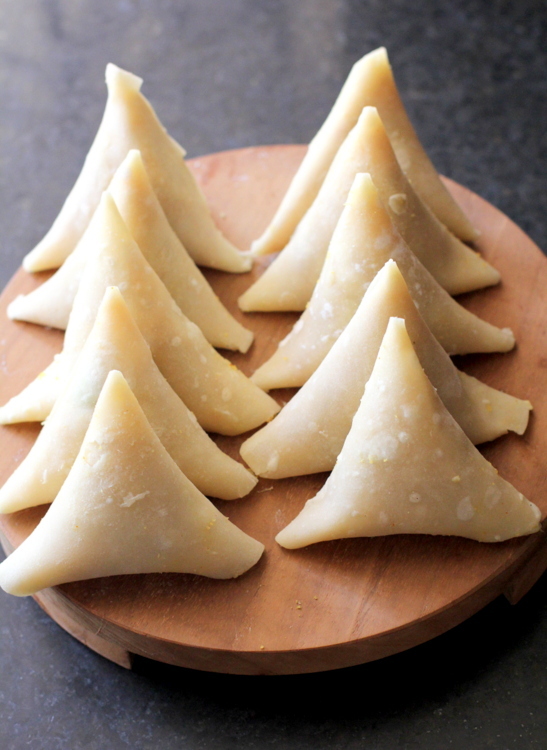 I get phyllo sheets but have never used them – how many sheets for one samosa.. can we use the single sheet? Thanks for sharing. I love eating these samosas. 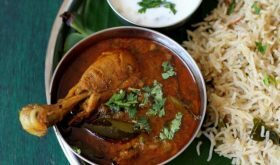 Used to get something similar at the Udipi restaurant in Bombay.. with poha and onions and if I’m not mistaken they also had some coconut and peas. Now coming to my question, here the main ingredient is flour, but which flour?? Is it regular wheat Atta which we prepare Chapathi or puri?? Thanks, Karthika. 🙂 Its maida not wheat atta. Hi Sailu, hope you are doing well. Those samosas love golden perfect! They are called Patti samosa to distinguish from Punjabi samosa also as the use thin strips of pastry. I use ready made phylo strips to make them. Have done them from scratch long long ago. 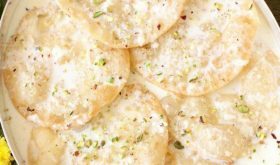 Hi Sailu, I love all your recipes. 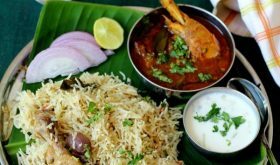 In this recipe, does the poha need to be cooked? There is no need to cook poha. Thank you! I have been looking for years for this recipe. I remember these from Udipi restaurants and vaguely knew it had a poha filling. I had no idea these were known as Irani samosas. I will defiinitely be making these.Thanks again! while placing roti on tawa,should we turn roti both sides???? ?or should we keep only one side of roti heated???? Both sides need to be cooked lightly. Hey Sailu, your recipes are so yummy. why dont you start to putting some videos. Any other substitute for poha? 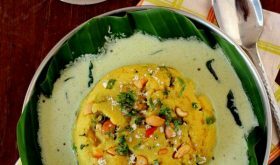 i have poha but not a mixi to make powder of it? Nima, you can lighty roast the poha to make it a bit crispy & pound it with a belan. in south indian hotels, i show some potatos in the Samosa. is it? Yes, to absorb any moisture in the filling. Thank you so much for linking your recipe to my blog. I only just spotted it. I would love to link up more recipes with you.